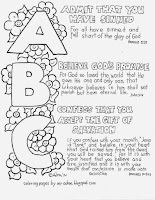 Free ABCs of the Gospel coloring page. Parents, teachers and homeschool families will find lots of uses for this simple Gospel illustration. There are a lot of ways children can color this picture, The letters are big and open and around the letters are smiley face flowers that can be colored in cheerful hues. 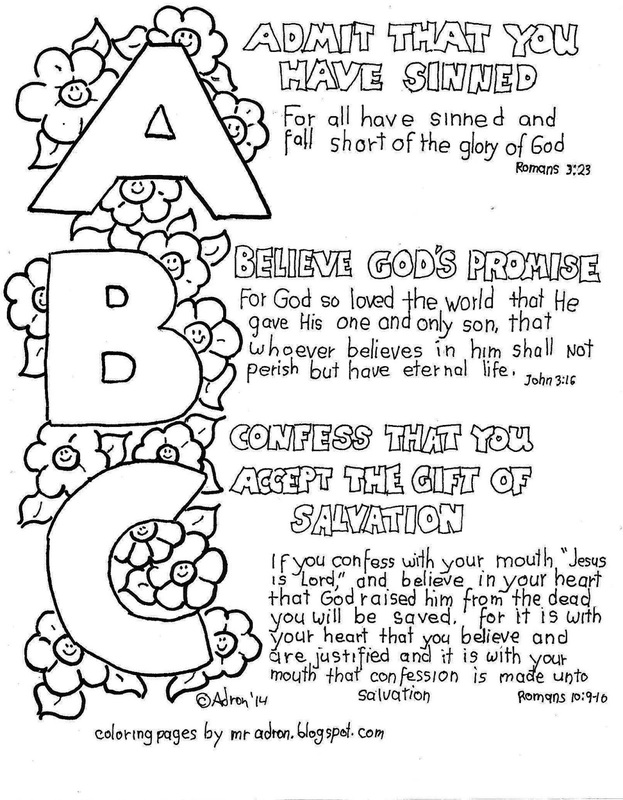 If you like this coloring page you might also like the Romans 3:23 coloring page. There are different scriptures that people use for the ABC Gospel outline but our lesson for the class this was designed for was focusing on these references. admit that you have sinned is, "For all have sinned and fall short of the glory of God." Romans 3:23. Believe God's promise is, "For God so loved the world that he gave his one and only son, that whoever believes in him shall not perish but have eternal life." John 3:16. Confess that you accept the gift of salvation is, "If you confess with your mouth "Jesus is Lord," and believe in your heart that God raised him from the dead you will be saved, For it is with your heart that you believe and are justified and it is with you mouth tat confession is made unto salvation." Romans 10:9-10.
family devotions or after school club. It can be combined with other coloring pages as a coloring book to give away at celebrations or leave in the waiting room of your business. 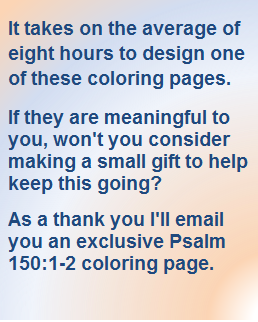 To see more free coloring pages like this click on the label for New Testament verse in the sidebar. To find more like this use the search-box above or choose from the most popular in the sidebar. I am sure you will find some you will like. Labels: Bible Verse, Easter, Gospel verse, New Testament verse. A B Cs of the Gospel print and color page. I enjoy utilizing your coloring pages in several ways, for the children that attend our small group home group, for my grandchildren, and for linking to in my blog. Thank you, so much! Thank you, I am so glad you are able to use them.